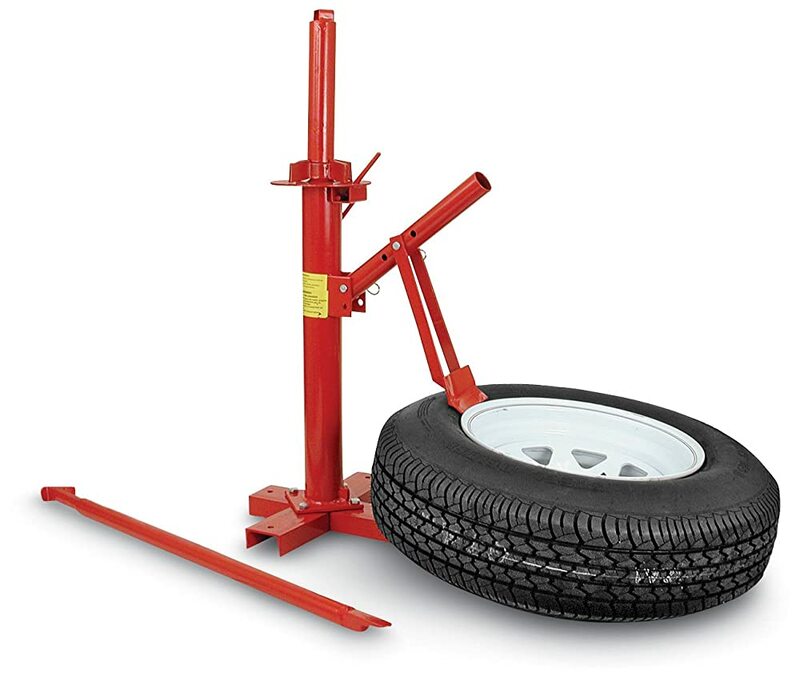 Best Manual Tire Changer Reviews: Report on Top 5 in April 2019! Best Manual Tire Changer: Top-Rated List is Here! So, you want to save some cash and change your own tire. Sure, go ahead, but remember that the tire is the most important part of the vehicle, it is what places the vehicle on the road, and maintains contact with the surface of the road. Essentially, the tire is the first and foremost safety device in your vehicle. 2. PowerLift Manual Tire This is the PowerLift Manual Tire Changer Base, 15-3/8-18-1/2"
If you have decided you still want to change your own tires, well, there are simple tools for this, after all, a tire changing process is actually a simple job, you remove the tire mechanically, and replace it the same way. You just need a basic tire changing tool for this, and you can even build your own if you are so included. You will note that some of the items here are bases, and other tools, you will need to buy a full kit, which includes a base and tools for optimum performance. Also take note, that the larger the tire, the harder it will be to change it manually, not only the weight issues hamper this operation, but the structure of the tire is harder to manipulate. Now let’s take a look at the best heavy duty manual tire changer options and look at the best tire changer on the market. There are in fact a few of them, and you will notice these are very simple tools that perform a very precise job, just like a scalpel. 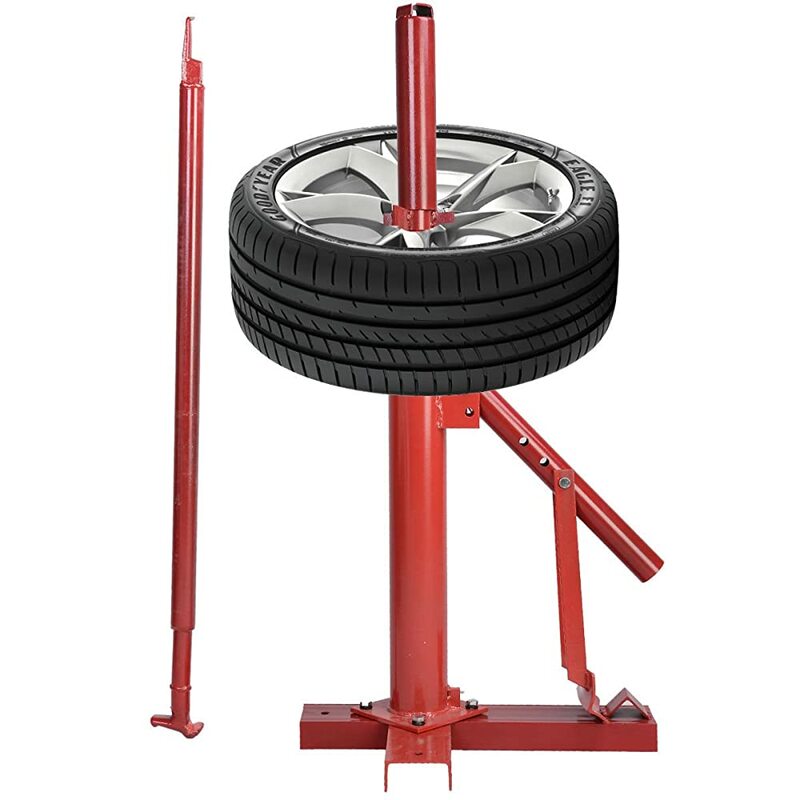 This base changer is made of heavy-duty steel and handles all tires from 8” to light trucks. It is also capable of handling flotation tires. 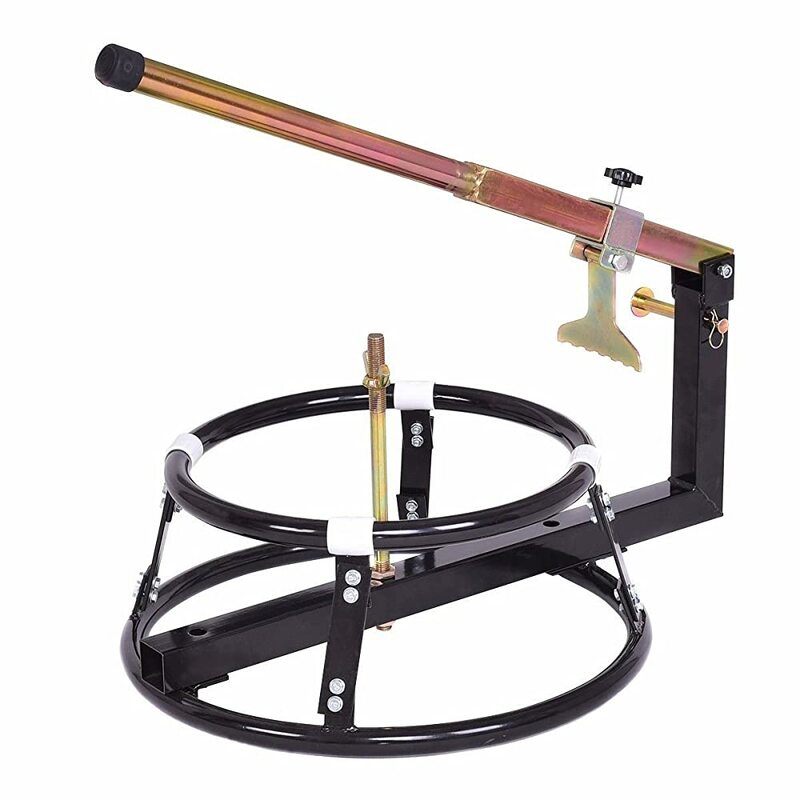 When you add the 60810-motorcycle attachment, you will be able to handle all 11” to 25” bike tire replacements too. This model is 37-1/2” high and 18-1/2 in long. 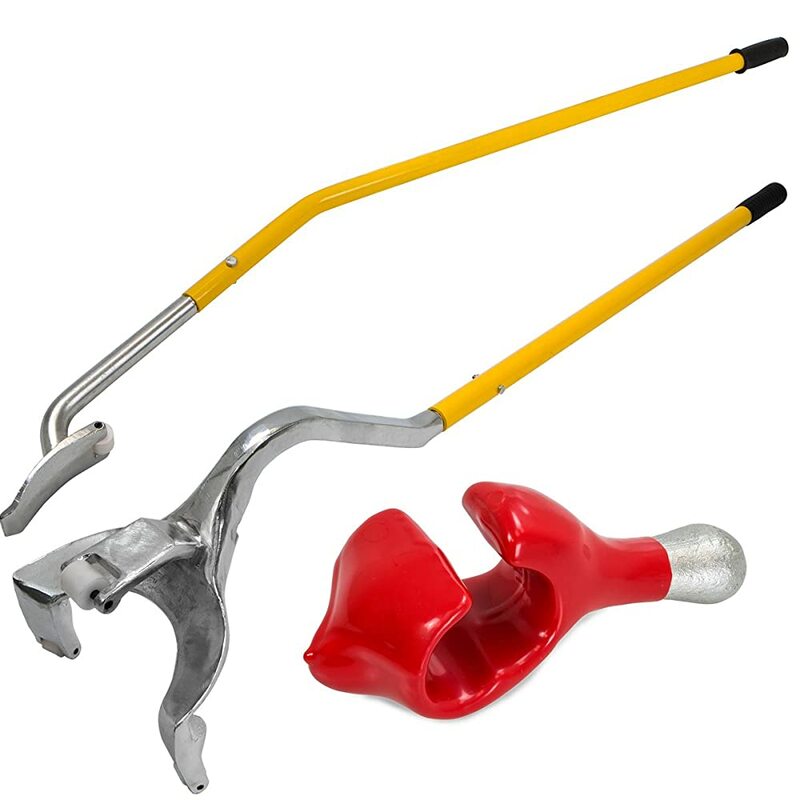 This is a classic tire changer tool, and you should consider this as the first choice when deciding what to buy. It is a great starter kit, as well as a great performance tool once you are experienced in using it. This is the base tire changer kit. This sets dimension is 15-3/8″ x 18-1/2″ and is made of steel, capable of handling all vehicle and light truck type tires. Essentially, this is a beginner set and is perhaps the one you want to buy for learning how to change tires. There are differences in operation between this style and the Goplus, and deciding which one is best for you will only come after experimenting with both. The Goplus tire changer is a powerful, steady tool made of Forged carbon steel and has a 3mm seamless tube main-body for extra strength. This tool is coated in a powder coated gloss for added resistance to corrosion. The changer will handle all 17.5″ to 24.5″ tires and protecting wheels, and uses only one tool for the entire operation. This is a toolset, not a changer base. You will need to buy a changer base for these to work with. This is a demount and mount toolset. 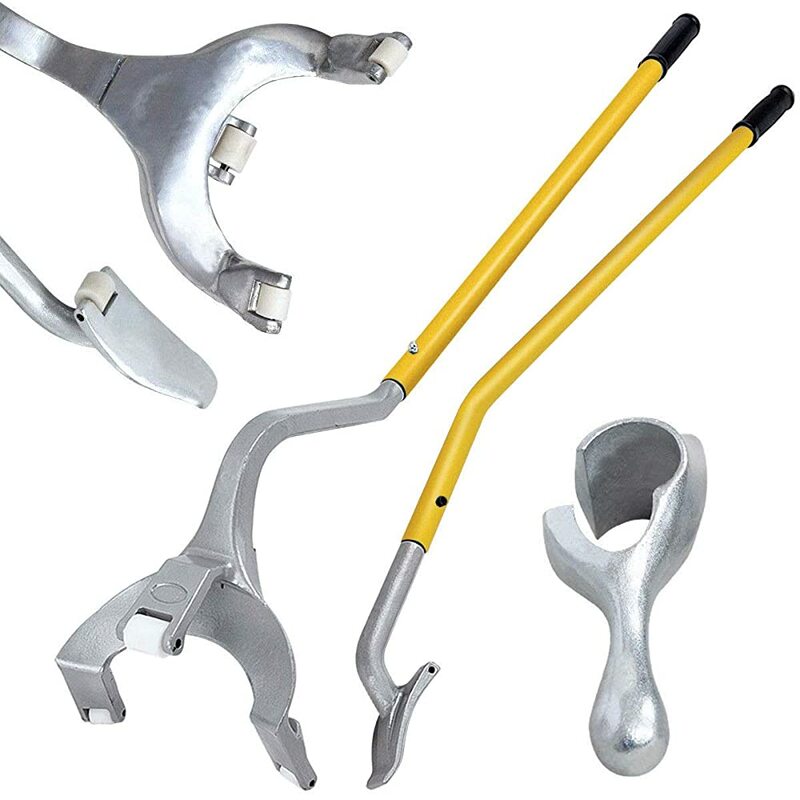 You will need a tire changer base for operation, but with these tools, you will succeed every time with an effortless level of performance. These tools can be used with all 17.5” to 24.5” tires, protecting wheels, super singles up to 315, as well as most radial and Bias Ply Tires. This kit is for large tires, so don’t try to change a motorbike or golf cart with these tools. This is a portable model, so its great for taking to competitions and race tracks. It is also great for the off-road situation and is made of iron. This models dimension is 29.5″L x 20″ W x 14″H and it weighs 16.4 lbs. I added this video, which shows how to (and not to) replace a tire. This is actually a very good video since the narrator/tire changer explains each step and adds personal experience. Anchor the device to your floor, make sure you anchor all four posts securely. You do this by drilling holes in the concrete floor, and then place the anchor and screw the bolts firmly into place. If you have a lug wrench or torque wrench, use it. Secure the four posts to the main piece using the hardware that comes with your kit. Remove all the air from the tire, do this by removing the valve stem. Make sure you have a valve stem removal tool, if not, pull it out with pliers (the old-fashioned way). Now place the wheel, face side up onto the manual tire changer. First, break off any wheel weights using a standard cutter or plier. Now take the pry bar, and place it between the tire and the wheelbase. Now pry the tire over the wheelbase, and continue doing this until all the tire surface is over the wheelbase. Now you need to repeat this for removing the lower section over the wheelbase; you do this by placing the pry bar between the tire and the wheelbase and turn again. 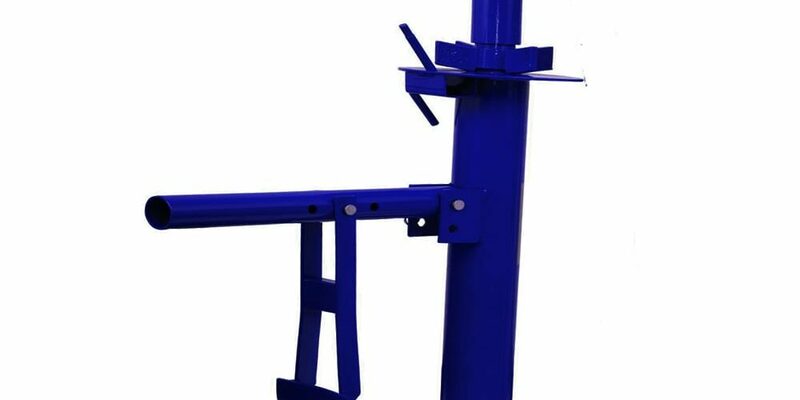 Now you perform the same process, whereby you take the replacement side of the pry bar and set the tire against the surface of the pry bar, you initially apply hand pressure on the tire and press the tire, after the first part is under the wheelbase, rotate until all the tire is in place. Now perform the same function for the second lip and presto you will have replaced the tire. The total time to replace a tire should be around 2 minutes for removal and maybe 3 for applying a new one. As with any new expertise, practice makes perfect, so I suggest you take a scrap wheelbase and a scrap tire and practice. Also, practice with motorbike tires, car tires, and truck tires, so you understand the difference between the three sizes and rigidity of tire surfaces. Note that this tire changing explanation is for car and truck tires, not bike tires. The operation of which is similar, but less stressful. You might consider some hole saws too. The plans are hand drawn and show you the essentials of building your own manual tire changer. Personally, buying one for a couple of bucks is cheaper and easier, but sometimes when you build something, you get to appreciate and understand its operation much better.